Razor thin but with expanses of screen real estate, Samsung’s Galaxy S III is the new pride of the Android fleet. Smartphones just keep getting bigger. At first glance the Galaxy S III’s massive 4.8-inch screen seems just too much to handle, but it grows on you quickly — especially if you’re upgrading from a screen that already measures more than 3.5 inches. The speed at which you acclimatise to the size of this beast is helped along by the fact the Galaxy S III is impossibly thin at 8.6mm and impossibly light at 130gm. The result is a smartphone which looks and feels great, sitting comfortably in your hand and sliding comfortably from your pocket. Fire up the Galaxy S III and you’re presented with a super-sharp 1280×720 display which rivals the resolution and overall image quality of Apple’s retina display on the iPhone 4S. 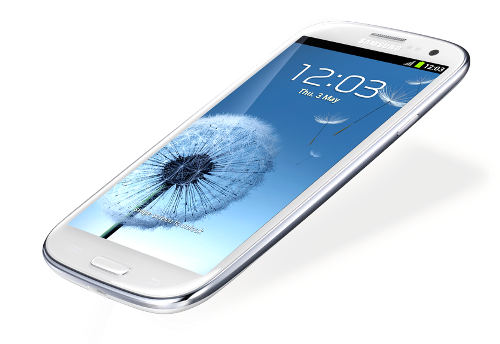 The Galaxy S III relies on a Super AMOLED screen, rather than an iPhone-style Super LCD screen. Traditionally AMOLED has been plagued by a blue-ish tinge and over-saturated colours, but this Super AMOLED screen is simply breathtaking — with white whites, great contrast and wide viewing angles. It still doesn’t handle outdoor glare quite as well as the iPhone. The Galaxy S III might look amazing, but thankfully its beauty isn’t just skin deep. Inside beats the heart of a lion — one of the first quad-core mobile processors accompanied by 1 GB of RAM. Rivals such as HTC’s One X also feature a quad-core powerplant. The One X is no slouch but the Galaxy S III thumps it when it comes to performance benchmarks. The Galaxy S III offers an impressive spec sheet, but standout features include 1.9MP and 8MP front and rear cameras (with 1080p video capture), a micro-SD card slot, Bluetooth 4.0 and Near Field Communications. About the only area where the Galaxy S III isn’t cutting edge is mobile broadband access. So far Samsung only offers an HSDPA-compatible version of the Galaxy S III in Australia, whereas HTC offers the LTE-compatible One XL as well as the HSDPA-compatible One X. LTE offers real-world download speeds of up to 40 Mbps, whereas the Galaxy S III will be lucky to hit 10 Mbps. Admittedly Australia’s LTE coverage is limited to Telstra and is very metro-centric at this point, but unfortunately the Galaxy S III also missed out on Dual Cell HSDPA. Found in HTC’s One X and One XL, DC-HSDPA still offers up to 20 Mbps on Telstra’s NextG network once you wander beyond LTE range. It’s easy to become obsessed with numbers, but to be honest you’re unlikely to notice the download speed difference with the Galaxy S III unless you’re regularly tethering it to your notebook. The Galaxy S III’s more powerful processor means it often loads webpages faster than the HTC One XL, even though the One XL can download data faster. Android fans will be pleased to see that the Galaxy S III runs Android 4.0 “Ice Cream Sandwich” out of the box, rather than relying on an over-the-air upgrade. That quad-core processor keeps everything running smoothly and you’ll notice it in all kinds of places, such as how quickly the camera app loads and snaps a pic. Samsung pre-installs an impressive range of apps including Quickflix movie rentals, MusicHub subscription music, Navigon sat-nav and Dropbox with 50GB of storage. That’s plenty to keep you occupied, plus the phone thankfully comes with a generous 2100 mAh battery which should get you through even the longest days.